OSHKOSH, Wis. - July 26, 2016 - PRLog -- Want your chance to get an up close look of the USAF F-4 Phantom in one of it's FINAL appearances?! Head to the DAV (Disabled American Veterans (http://www.dav.org)) Flight Team display on Warbird Alley at this year's AirVenture Oshkosh. The DAV Flight Team will be accompanied by a different current military aircraft each day of AirVenture 2016. Tuesday, July 26th will feature the legendary QF-4 Phantom drone in what is most likely its final year in service. Like a Phoenix rising from its ashes, the QF-E retired to Davis Monthan AFB only to be miraculously brought back to life. Entering the service in 1960 for the US Navy, this McDonnel Douglas designed aircraft has flown for the United States forces for 55 years. In its for decades of active service in the United States, the aircraft set sixteen world performance records and downed 280 claimed victories, more than any other U.S fighter in the Vietnam War. In the later decades it served strictly in the Full Scale Aerial Target (FSAT) drone role. Today, the tandem two-seat, twin engine aircraft is on a new mission of outreach to local AirVenture veterans. "The F-4 is an aircraft that many of us worked on, flew or knew someone who did," said Veitnam veteran Paul Fluette. "It is great to see this girl one last time. It really is a beautiful tribute to honor those the men and women who served, especially those of us who knew her so well." 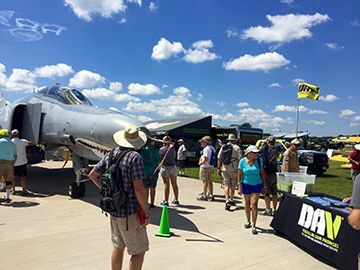 The F-4 Phantom will be at the DAV Flight Team display this Tuesday of AirVenture. This year will most likely be the end of the F-4 Phantom. At the end of the program any remaining Phantom aircraft will be de-militarized and used at bombing ranges in Holloman AFB in New Mexico for ground targets. Disabled American Veterans, representing 1.3 million disabled veterans, is a non-profit organization founded in 1920 and chartered by the U.S. Congress in 1932. It is dedicated to one, single purpose: Fulfilling our promises to the men and women who served.